Agrimelt S anti-icing/de-icing fluid is an all-natural, agricultural product blended with sodium chloride brine. Agrimelt S features versatile ice control performance superior to traditional brines. Agrimelt S not only lowers the freezing point of the sodium brine, but it also reduces salt induced corrosion. Agrimelt S anti-icing/de-icing fluid is highly effective for anti-icing and pre-wetting. The following suggested usage levels should be considered as starting points and should be adjusted as needed based on operator experience to meet local conditions such as current and forecasted road and air temperatures, precipitation, traffic volume, etc. - Apply 60-100 litres/lane KM using a stream nozzle. - Adjust the amount as needed to meet local conditions. or below, preferably just before precipitation begins. - Prevents snow and ice from bonding to the pavement making removal easier. - Lowers maintenance costs by reducing the number of applications and quantities needed. - Reduces salt brine induced corrosion. Apply at 20-42 litres per tonne of salt or salt/sand mixtures at the spinner. Adjust the amount as needed to meet local conditions. - Enhances the de-icing performance of dry salt or salt/sand mixtures. - Jump-starts the de-icing process. down to only 4% loss. 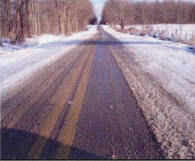 - Pre-wetted salt and salt/sand mixtures stay on the road. - Less salt or salt/sand mixtures are needed for the same effectiveness. Agrimelt S anti-icing/de-icing fluid is designed as a direct replacement for salt brines and provides superior anti-icing/de-icing performance. Agrimelt S anti-icing/de-icing fluid is compatible with all existing brine storage tanks and spray equipment. Agrimelt S anti-icing/de-icing fluid works at temperatures where salt brines alone are no longer effective. 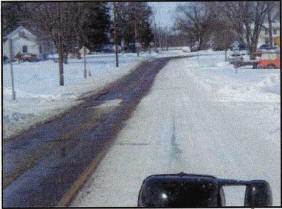 Anti-icing/de-icing performance superior to salt brines is achieved using less Agrimelt S anti-icing/de-icing fluid. Fewer litres are needed to achieve the same performance as with salt brines alone. That means more lane kilometers per truckload, improved efficiency and less equipment corrosion. Test results from an independent lab have shown Agrimelt S anti-icing/de-icing fluid is only one third as corrosive as salt. Make Agrimelt anti-icing/de-icing fluid an effective part of your corrosion control programs. The information and recommendations in this publication are, to the best of the sellers knowledge, accurate. however, because of numerous factors affecting test results, seller makes no warranty of any kind, express or implied, other than the product conforms to its applicable current standard specifications. Statements concerning the use of the products or formulations described herein are not to be construed as recommending the infringement of any patent.